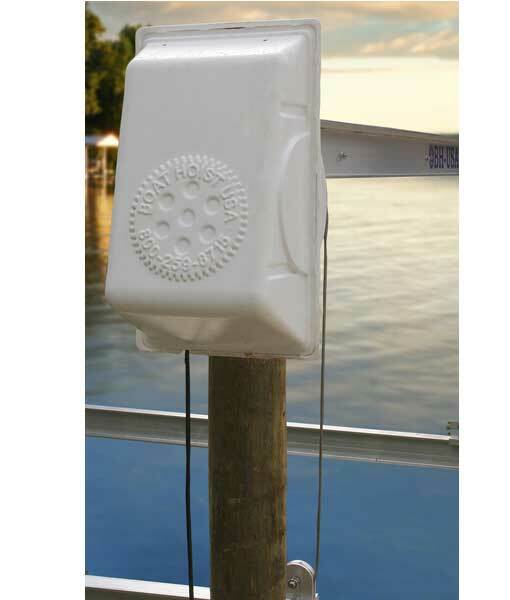 Our Pile Mount Boat Lifts and Hoist from Boat Hoist USA can handle boats up to 24,000 lbs. 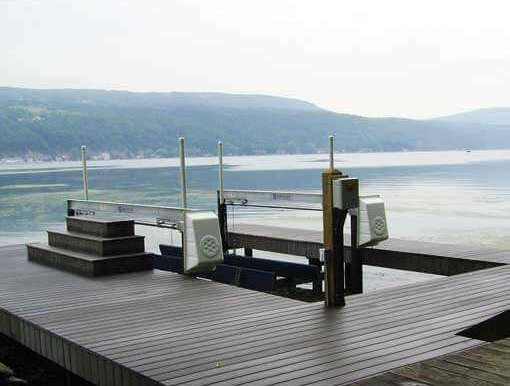 The BH-USA Galvanized Boat Lift is a strong, reliable lift that will last a lifetime. Best of all, this lift won't cost more than your boat! 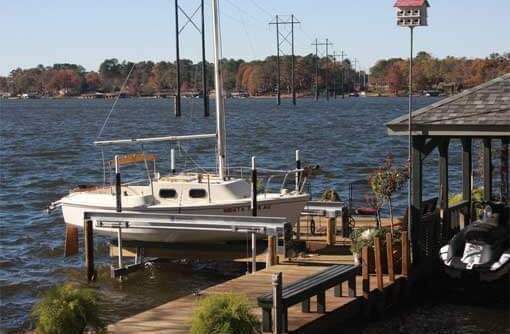 Hot-dipped galvanized top beams have been used in the boat lift industry for over 50 years; they are stronger than aluminum and will last virtually forever in a marine environment. 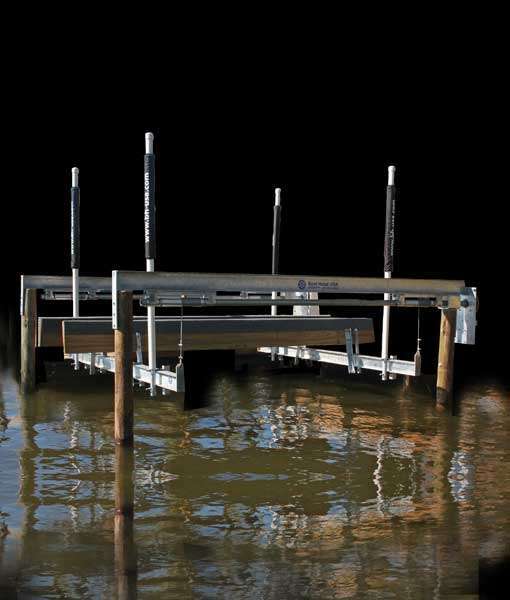 The BH-USA Galvanized Boat Lift takes the boat lift back to the basics, when all you needed was a well-built lift! Hot-dipped Galvanized; Stronger than Aluminum; Manufactured by BH-USA; Powered by two BH-USA flat plate hoists; Lifetime Warranty; Affordable. Lifts come standard with two top beams, cradle beams, Galvanized steel 5/16 cable, pipe, chock angles for two bunks, two flat plate hoists with covers, guide posts and standard wiring at 110 volt. 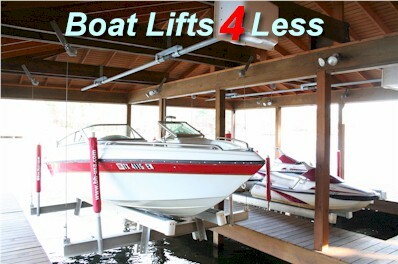 Lifts do not include wood bunk boards or pilings. On all lifts Top beams are 6" x 4" 9# wide flange beams 13ft long. Drive pipes are 2" ID sch 40. Top beams for 10 and 12K lifts have welded dead man tab for compound cable. Cradle beams on 6K and 8K lifts are 5" beams and 6" beams for 10K and 12K lifts. Cradles come standard 10ft wide with 16" universal wood bunk mounts for two bunks. Guide post stanchions and bumper are included. Lifts are powered by BH-USA standard back plates with white covers. 6K and 10K lifts come with 3/4hp motors and 8K and 12K come with 1hp motors. Motors are wired for 110volt and each motor has a maintain switch. (GEM remote option sold separately) 6K and 8K lifts are straight line lifts and come with 5/6" galvanized steel cable with 15ft drops. 10 and 12K lifts are compounded with 5/16" galvanized steel cable 31ft. Lifts are shipped crated and are very heavy; recommend fork truck to unload from freight truck. Galvanized Lifts usually ship from BH-USA in 4 days or less. Please see attached guide for recommended pilling size and spacing. Lifts do not include bolts to mount to pilings. All items on the BH-USA Galvanized lift are manufactured by or under the supervision of BH-USA and are covered by BH-USAs standard warranty. For more information please contact BH-USA directly or download the BH-USA full terms and conditions. We stand behind our product and offer the best guarantee in the industry! Note about cable winders. Unlike standard aluminum lifts, the drive pipes on the galvanized lifts are 2 3/8" OD. If you choose to put cable winders (not included) on the lift you will increase the diameter of the pipe, speeding up the lift but reducing the overall lifting capacity.